One of the best ways to compare your game to the touring professionals is to go to the practice range during one of their tournaments, and just watch. 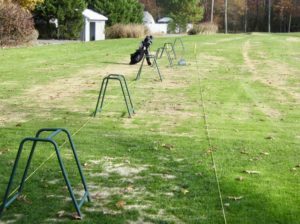 Most golfers would play better if they spent quality time on the practice range in addition to time out on the course. You should quickly learn to appreciate the combination of talent and work ethic that distinguishes what they do routinely and what you might be able to do occasionally. I had a focused lesson from Rookery North head pro Kyle Deas over a year ago, focused on learning a useful method to make both chip and short pitch shots. In essence, I open my stance, keep the clubface of my sand wedge aimed at the target, keep most of my weight on the left (front) side, and swing along my shoulder line. Hitting the right distance depends on how far back I take the club and how open I make my stance. The more open my stance, the more loft I add to the club. The more I take the club back, the farther the ball goes when I swing through. That’s about it. After hundreds of practice shots and dozens of rounds since that lesson, I’m now pretty comfortable with my chances for a one-putt par or even a chip-in on occasion-but it took a lot of work to break some old and not-so-great habits. At the 2018 ShopRite LPGA Classic presented by Acer, I watched LPGA golfer Jennifer Song take alternating wedge shots to two holes on a practice green 40 and 50 yards away, from a spot of closely mown turf. Song’s technique was very different, and from my perspective, also very brave. She lined up parallel to the target, and opened up her wedge a full 45 degrees from perpendicular. The clubface looked nearly flat against the ground. With her smooth swing the ball would balloon in the air and come down softly, usually with good results. I spoke with Aaron Landry, Song’s caddie. He said the reason for this particular practice was they noticed in past tournaments that Song was holding the grip end a little too close to her body during these shots. Landry also said she was using a 58-degree Mack Daddy Callaway sand wedge, with only 8 degrees of bounce on the bottom of the club. My 54-degree wedge has 11 degrees of bounce, which makes it useful for a wide range of turf conditions. The bounce on Song’s wedge can work better on tighter lies, which she sees more often in tournament conditions than I might experience during a casual round on Cape Region courses. However, with her club it also takes a good amount of practice and a good amount of nerve to avoid either digging into the turf behind the ball or skulling the ball at its equator. I also watched Pernilla Lindberg and her fiancé/caddie Daniel Taylor on the range as she hit 60-yard wedge shots. The 2018 ANA Inspiration major winner kept to a specific, detailed pre-shot routine that I also observed when she won that tournament earlier this spring. Lindberg’s alignment was slightly open to the target line. She brought her feet together at address before opening to a fairly narrow stance, inside her shoulders. She dropped the club behind the ball, raised it straight up about half way, and dropped it again. Lindberg then took a half-swing back, with her hands just below her right shoulder, with the club almost vertical. She brought the club back to its spot behind the ball, and let her right shoulder dip noticeably toward the ground. At that point she made her swing and watched the results. Lindberg’s caddie stood opposite her and recorded a few shots on his phone. After a while she stopped swinging to see what the video clips were telling them. This series went on for at least twenty minutes, if not a full half-hour. Lindberg never varied her routine, which I thought was the most remarkable thing about her practice session. The Kings Creek CC Ladies 18-hole group played a lot net game Oct. 4. MaryAnn Vietch won first place in the first flight, with Ruth Lauver in second, Judy Wetzel in third, and Cory Warther in fourth. Kelly Brown won the second flight, with Trish Ritthaler in second, Anne Farley in third, and Joanne Yurik in fourth. The Kings Creek CC Ladies 18-hole group played a Tee to Green game Sept. 26, in which only the strokes used to reach the greens were counted. Candie Robinson won first place in the first flight, with Winnie Sewell in second and Judy Wetzel in third. Deb Grant won the second flight, with Joanne Yurik in second and Carol Loewen in third. 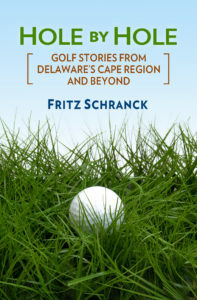 The Rehoboth Beach CC Ladies Day team game format on Sept. 26 was two best balls of four. JoJo Barrows, Penn Emerson, Beth Forbes, and Judy Holtzclaw won first place gross. Barrows was closest to the pin on the 19thhole. Jeanne Allan, Gina Bergin, Suzanne Moore, and Kim Stockson won first place net.